ONCE upon a time, in Spain, you could tell a good place to eat by the number of prawn heads littering the bar floor. 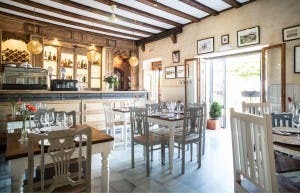 Not in Vejer de la Frontera, a best-kept secret where potted geraniums flower perennially and even the tiniest tapas bar sports a swanky designer makeover. But it’s not just window dressing. The gourmet dishes being rustled up by local restaurateurs live up to the high expectations of every visitor who makes it to the summit of this stunning white hilltop pueblo where the views are equally mouth watering. The lush orchards spread out below this historic Moorish frontier town are behind Vejer’s reputation as the gastronomic jewel in the Costa de la Luz crown. The abundance of organic homegrown produce is a source of inspiration to local chefs. For proof, count the number of restaurants in Calle de la Corredera – Vejer’s ‘foodie street’ in the medieval quarter. My restaurant, newcomer CORREDERA 55’s restaurant and terrace, beneath the castle walls, overlooks a landscape of rolling hills, Quixotic windmills and spectacular sunsets. The menu is a fusion of world flavours with my bouillabaisse soup, swimming in local seafood, and the carrillada (pigs cheeks) from local butcher Antonio, braised for five hours in vino de Jerez and served with cinnamon-scented cauliflower puree. On Sunday I do a whole-roasted spatchcock chicken to go with the Sunday papers, and a pot of Moroccan tea and a blanket to keep out the winter chill. Designed by Scottish owner James Stuart, who opened Vejer’s Hotel La Casa del Califa over two decades ago, it has loads of artworks by his favourite local artists and his cookbook collection. Meander round to the Plazuela to find intimate VALVATIDA (meaning starfish), owned by Jesus Recio and partner Tamara Cansino. Creative home cooking with seasonal produce from the huertas of Conil and La Muela is their ‘usp’. Starfish may not be on the menu – Tamara named the restaurant for her fisherman father who brought her back gifts of starfish from his trips – but you’ll find many inventive dishes: prawns in manzanilla with Iberian pork and nuts and octopus in seaweed mayo are just two. Culinary creativity continues at family-owned CASA VARO, facing Divino Salvador church. Bougainvillea canopies the terrace and owner Juan Varo will tell you everything you need to know about their speciality almadraba tuna – ecologically caught in trap nets, a method dating from Phoenician times. Only the finest specimens are used in their signature dish, tuna carpaccio, the tataki and tuna tartar melt in the mouth quality, and there are 70 wines, one to complement every dish. The restaurant that put Vejer on the gastro map is La Casa del Califa’s award-winning EL JARDIN DEL CALIFA. Reached through the labyrinthine corridors of the 16th century hotel, the exquisite palm courtyard enclosed by ancient walls and lit with Moroccan lamps after dark radiates a 1001 Nights buzz. If you aren’t hypnotised by the scent of frangipani, jasmine and incense, wait until you try the menu, a heavenly harem of authentic flavours from north Africa and the Middle East: babaganoush, shish taouk, popular pastela filled with chicken, almonds and cinnamon and tempting tagines. The tagine Rif combines local organic beef with caramelised pumpkin and figs. The delicious homemade desserts and pastries taste even better with a pot of Moroccan mint tea. Complementing the culinary repertoire, the bodega stocks over 80 wines – including Tunisian Sidi Brahim and Lebanese Ksara. The hotel and restaurant are open all year and there are no end of cosy corners to curl up on a pile of Moroccan cushions with a book and a glass of warm spiced wine. A visit to Vejer isn’t complete without tasting the vast range of libations at VINA Y MAR. Ramon Fernandez offers over 40 sherries by the glass, ranging from a €2 manzanilla to a special reserve (VORS) at €6, plus over 200 wines, and there’s an open kitchen in case your hunger catches up with your thirst. Vejer’s success story is a simple recipe: local knowledge, generous helpings of homegrown produce and a bunch of dynamic international restaurant owners who’ve added their own dash of creativity. Enjoy!